Blue & Gold Fleet, Pier 39, ☎ +1 415 705-8200 ([email protected], fax: +1 415 705-5429), . Times vary — see website. Offers ferries from Sausalito, Tiburon, Angel Island, Vallejo, and Alameda/Oakland to Pier 41. Price varies by departure point: adults $7.75-$12.50 one-way, children $5-$6.25 one-way. Alameda/Oakland Ferry, Pier 41, ☎ +1 510 749-5972 ([email protected]), . Times vary — see website. Offering ferry service to/from Alameda/Oakland and Angel Island. Adults $6.25 one-way, seniors $3.75, children $3.50 one-way. Vallejo Baylink Ferry, Pier 41, ☎ +1 877 643-3779 ([email protected], fax: +1 707 562-3141), . Times vary — see website. Offering ferry service to/from Vallejo. Adults $13 one-way, seniors/children $6.50 one-way. Pier 39, the Embarcadero at Beach St (located on the eastern fringe of Fisherman's Wharf), ☎ +1 415 705-5500 ([email protected]), . A 45-acre pier-complex featuring 100 specialty stores, 12 full service restaurants, theater, cruises, live entertainment, and more. Free. Marina, West and East Marinas (on both sides of Pier 39), ([email protected]), . Don't get lost amongst all the tourist stores, and forget that Pier 39 is a pier after all — so why not check out the impressive flotilla of vessels moored at its 11 docks on either side of the pier. Free. 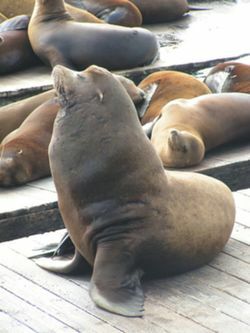 The sea lions, Pier 39's West Marina, ☎ +1 415 289-7325 ([email protected]), . A short time after the 1989 Loma Prieta earthquake struck, these sea lions moved bag-and-baggage into the west marina at Pier 39. There can be as many as 900 sea lions there during the winter months. In the summertime many of them migrate but there is always a steady population at Pier 39's K-Dock all year round. The Marine Mammal Center’s Kiosk is located next to the sea lions where volunteers are happy to answer questions about the mammals. Free. Street Performers, the Crystal Geyser Alpine Spring Water Center Stage (at the end of Pier 39), . Daily Show Times: 12PM, 1:15PM, 2:30PM, 3:45PM, 5PM, 6:15PM, 7:30PM & 8:45PM. Colorful jugglers, magicians, clowns, mimes, and comedians of all descriptions entertain Pier 39 visitors throughout the day. Free. USS Pampanito Submarine, Pier 45 (at Taylor St and the Embarcadero), ☎ +1 415 775-1943 ([email protected]), . Opens at 9AM daily. Call for closing time. This is a National Historic Landmark — an authentic WWII submarine with many original artifacts on display. Up to 80 personnel ran this submarine and it could be at sea for up to several weeks at a time. $10 adults, $6 seniors, $4 children/active military, free for children under 6. $20 for family of 2 adults and 4 children. SS Jeremiah O'Brien, Pier 45 (at Taylor St and the Embarcadero), ☎ +1 415 544-0100 ([email protected], fax: +1 415 544-9890), . 9AM-4PM daily. Located behind the Pampanito submarine is this WWII Liberty Ship open for tours. The SS Jeremiah O'Brien is the sole survivor of the armada of Allied ships which was involved in D-Day, and one of only two remaining WWII Liberty Ships surviving today (the other being the SS John W. Brown in Baltimore). $12 adults; $8 seniors, $6 children, free for children under 6 and active U.S.Military. Amusing America Exhibit, Pier 45 (at the foot of Taylor St), . 10AM-8PM daily. An fun exhibit that traces the history of amusement attractions in American cities, with a focus on San Francisco. Free. Musee Mecanique, Pier 45, Shed A (behind Fisherman's Grotto No. 9), ☎ +1 415 346-2000 ([email protected]), . M-F 10AM-7PM, Sa-Su and Holidays 10AM-8PM. Has quite an interesting collection of about 300 coin-operated musical instruments and antique arcade machines, that date from the turn of the century. Fishermen's and Seamen's Chapel, Pier 45 (Taylor St and Embarcadero), . This tiny chapel is a memorial to the "Lost Fishermen"... those that have lost their lives on the seas. Every year they hold a special service to commemorate these fishermen. The annual "Blessing of the Fleet" also starts from here every October. Free. Wax Museum at Fisherman's Wharf, 145 Jefferson St, Suite 500 (between Mason St and Taylor St), ☎ +1 800 439-4305 ([email protected]), . 10AM-9PM daily. It has more than more than 270 wax portraits of entertainers, heroes, villains, etc. Adult (18-54) $14, Child (6-11) $7, Junior (12-17)/ Senior (55+) $10. Ripley's Believe It Or Not! Museum, 175 Jefferson St (between Mason St and Taylor St), ☎ +1 415 771-6188 ([email protected], fax: +1 415 771-1246), . Mid June - Labor Day Su-Th 9AM-11PM, F-Sa 9AM-midnight; rest of the year Su-Th 10AM-10PM, F-Sa 10AM-midnight. Set over 2 floors it has over 10,000 square feet of galleries, exhibits, illusions, and interactive displays. $19.99 (ages 13 and older), $9.99 children (ages 5-12). Fish Alley, (turn right off Jefferson at Leavenworth). 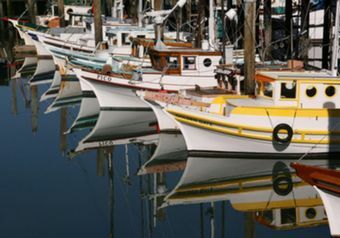 Don't forget to go and see the real fishing boats at what’s known as Fish Alley — after all it is "Fisherman's Wharf". If you want to see them actually hauling in their catch, you'll have to be there around 6AM to 7AM. Free. The Cannery, Del Monte Square (at the foot of Columbus St), ☎ +1 415 771-3112 ([email protected], fax: +1 415 771-2424), . Built in 1907 with its award-winning architecture, the Cannery overlooks San Francisco Bay and once upon a time was the largest peach cannery in the world. Today it's a bustling marketplace featuring three levels of restaurants, shops, offices, and live entertainment. In the middle it has a secluded courtyard with outdoor bars and cafes. 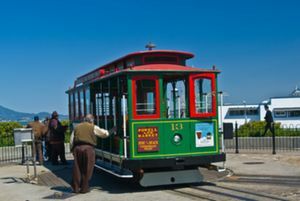 San Francisco Maritime National Historical Park, (begins at the Hyde St pier), ☎ +1 415 447-5000 (fax: +1 415 556-1624), . 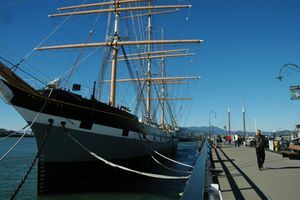 The park consists of a visitor center, Hyde St Pier and the fleet of historic ships moored there, the Maritime Museum, Aquatic Park, and the Municipal Pier. Visitor Center, The Cannery, Del Monte Square (at Hyde and Jefferson, across the street from the bridge), ☎ +1 415 447-5000. June 21 - August 15: 9:30AM-6PM; August 16 - June 20: 9:30AM-5PM. The Visitor Center has a visitor information desk and there are also a bunch of small craft and hands-on exhibits that depict San Francisco's rich maritime heritage. Free. Hyde St Pier, (at the foot of Hyde St). June 21 - August 15: 9:30AM-6PM (last entry 5:30PM); August 16 - June 20: 9:30AM-5PM (last entry 4:30PM). Prior to the construction of the Golden Gate Bridge and the Bay Bridge, this historic ferry-pier was the primary automobile ferry terminal that connected San Francisco with both Marin County and the East Bay. Free. Fleet of Historic Vessels, moored at Hyde St Pier (at the foot of Hyde St), . Six major ships are on display on the Hyde St Pier. Some are available for a self-guided tour, others by docent-led tours. On payment of the $5 National Park Service fee several can be boarded, depending on tides; kids can join for free. Among the ships you can see are the Balclutha, an 1886 steel-hulled square rigged sailing ship, the Eureka, an 1890 steam ferryboat (which also has an exhibit of antique cars on board), the C.A. Thayer, an 1895 lumber schooner, and the Hercules, a 1907 steam tug. Boarding pass for historic vessels: $5 adults, supervised children under 16 free. Maritime Museum Building, (located in Aquatic Park at the western end of Fisherman's Wharf), ☎ +1 415 556-3002. Daily 10AM-4PM. Shaped like a ship, this historic building was originally built by the WPA as a bathhouse and served as the Maritime Museum for many years before a recent renovation. The maritime exhibits have been moved to storage and the Visitor Center, but you can enter and view the beautiful underwater-themed murals. Free. Aquatic Park and Municipal Pier, (located at the western end of Fisherman's Wharf). This area was once part of Fort Mason but is now a complex for museums and artisans, and a great place to take a break from the bustle of Fisherman's Wharf. There is a small beach at the foot of the park where you'll see kayakers, kite fliers, swimmers from the nearby Polar Bear Club, and even rock sculptors at work. At the end of the park is Municipal Pier — the closest you can get to Alcatraz on foot or bike. After dark it can be a bit desolate. Free. Ghirardelli Square, 900 North Point St (at the corner of Beach St and Larkin St), ☎ +1 415 775-5500 ([email protected], fax: +1 415 775-0912), . It was officially declared a city landmark in 1965, and today it's still possible to view the remnants of the old chocolate-making machinery there. The square is packed with boutiques, restaurants, specialty stores, and galleries. It also has great views over the Bay. Free. Pier 39, (at Beach St and the Embarcadero). Detailed information listed under the See section above. City Kayak, Pier 39, slip A21 and Pier 40, South Beach Harbor (at Beach St and the Embarcadero), ☎ +1 415 357-1010 ([email protected]), . M-F 1PM-6PM, Sa-Su 11AM-6PM (last launch at 4PM). Enjoy the many great views of San Francisco from the water. They offer kayak rentals from South Beach Harbor in San Francisco but only kayak trips from Fisherman's Wharf location. A 'trip' comes with a guide. Rental session $49 adults, $44.10 youth; rental $14-$29/hour, depending on kayak. Frequent Flyers, Pier 39 (near the end of Pier 39), ☎ +1 415 981-6300, . Su-Th 11AM-8PM, F-Sa 10AM-10PM. This is an exciting bungee/trampoline combination, suitable for all ages, which allows you to experiment with the dare-devil acrobat inside of you. It's possible to reach heights of up to 20 feet in the air. $10 per session. Ride the carousel, (first level at the Bay end of PIER 39), . Crafted in Europe, this fun carousel is famous as the only one of its kind in the US that has artistic depictions of its native town hand-painted onto its frame. $3 per ride. Riptide Arcade, Pier 39 M-3 (at the end of Pier 39), ☎ +1 415 981-6300 ([email protected], fax: +1 415 981-6308), . Su-Th 10AM-10PM, F-Sa 10AM-11PM. Have some fun in the largest games arcade in San Francisco. Free Admission, price of games varies. Turbo Ride, Pier 39 (near the end of Pier 39), ☎ +1 415 392-8872, . An action packed adventure using sophisticated simulation technology to combine visual high resolution graphics with hydraulically powered movement. $12.95 adults, $9.95 seniors (60+)/ children (3-11). For two features or a combo ticket, the admission is $15.95 adults, $12.95 seniors/children. The multi-ride ticket, which allows the visitor to ride each of the features, costs $17.95 adults, $14.95 seniors and children. Boudin Museum and Bakery Tour, 160 Jefferson St (between Mason St and Taylor St), ☎ +1 415 351-5561, . Daily 12PM-7PM. Take a tour round the bakery, enjoy some of their interactive exhibits and learn about the history of Boudin. Cable Car, Powell-Mason Line from Taylor & Bay or Powell-Hyde Line from Beach & Hyde (at Hyde St and Beach St), ☎ +1 415 981-6300 ([email protected]), . This is fun way to enter or leave the Wharf area. For your convenience, two cable car lines terminate at Fisherman's Wharf — one at Hyde St & Beach St and one at Bay St & Taylor St. $6 each way ($1 for seniors or disabled before 7AM and after 9PM). Electric Tour Company Segway & Electric Bike Tours, Tours depart from the rear parking lot at 757 Beach St (near the corner of Hyde St), ☎ +1 415 474-3130 ([email protected], fax: +1 415 885-6070), . Segway tours daily 9AM, 12:30PM and 4PM April-October & 10:00 AM and 1:30PM November-March, electric bike tours daily 10AM. Take a 2 1/2-3 hour tour of Fisherman's Wharf on a segway, or ride an electric bike over the Golden Gate Bridge to Sausalito, returning by ferry. $70 per person (advanced reservations are required). Walk. Walk and enjoy being a tourist. 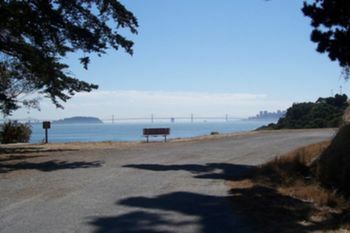 If it gets too much for you, escape to the west into the Marina and the Presidio. You can always find a bus to take you back. Angel Island, . Angel Island is open from 8AM to sunset year around. Take a ferry to this historic California State Park and wildlife preserve — the "Jewel of San Francisco Bay". 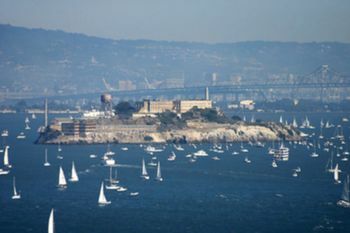 Spend a whole day on the largest island in San Francisco Bay, which was once known as the "Ellis Island of the West". There are lots of activities once you get there — picnicking, hiking, biking, boating, camping, and baseball, or just spend a day lounging on one of the many beaches there. Bay Cruises. Bay cruises are very popular 60-90 minute boat tours that usually take you underneath the shadows of the Golden Gate Bridge, around Alcatraz, and along San Francisco's historic 150 year old waterfront. They also offer great views of the city's skyline. Some of them come with lively guides, others with headphone audio equipment. Some cruise providers have extended routes that take you past Angel Island and close to the shores of Tiburon and Sausalito. Others provide alternate routes that sail under the Bay Bridge as far as AT&T Park, along the San Francisco skyline, around Treasure Island, and along Alcatraz Island. Several operators provide specialist cruises of all descriptions including 'Sunset Cruises' and 'Dining Cruises' among others. Ferries. You can also take a simple ferry across the bay to Sausalito, Tiburon, Vallejo, or Alameda/Oakland, and explore on from there. Adventure Cat Sailing Charters, J Dock next to Pier 39 (at Beach St and the Embarcadero), ☎ +1 212 209-3370 or +1 800 498-4228, . Cruise times vary — see website. Offers a 90 minute bay cruise on a 55-foot luxury Catamaran and also sunset cruises in the evening. Bay Cruise: Adult: $30, children 6-12: $15, children 5 and under: $2; Sunset Cruise: Adult: $45 (no discount for children) — Sunset Cruise includes light hors d’oeuvres and 2 complimentary drinks. Alameda/Oakland Ferry, Pier 41 (at Jefferson St and the Embarcadero), ☎ +1 510 749-5972, . weekends/holidays only from late May through October. Offering ferry service to Alameda/Oakland and Angel Island. Adults $6.25 one-way, seniors $3.75, children $3.50 one-way. Blue & Gold Fleet, Pier 39 (at Beach St and the Embarcadero), ☎ +1 415 705-8200 ([email protected], fax: +1 415 705-5429), . Cruise times vary — see website. In addition to their bay cruise from Pier 39, Blue & Gold Fleet offers ferries from Pier 41 across the bay to Sausalito, Tiburon, Angel Island, Vallejo, and Alameda/Oakland. Blue & Gold Fleet also runs a "RocketBoat", a high-speed cruise of the bay in a sleek red boat. Bay Cruise: adults $24, seniors (62+) and teens $20, children (5-11) $16. RocketBoat: adults $26, seniors (62+) and teens $24, children (5-11) $21. Ferries (price varies by destination): adults $7.75-$12.50 one-way, children $5-$6.75 one-way. Red & White Fleet, Pier 43½ (Taylor St and the Embarcadero), ☎ +1 415 673-2900 (fax: +1 415 447-0619), . Cruise times vary — see website. They offer a 1 hour "Golden Gate Bay Cruise" which goes under the Golden Gate Bridge and around Alcatraz, a 2 hour "California Sunset Cruise" which goes around Angel Island, and a 90-minute "SF Explorer Cruise" which goes under the Bay Bridge toward SoMa. Bay Cruise: Adults $22, children/teens (5-17) $16. Sunset Cruise: Adult (18+) $48; and Youth (5-17) $34. SF Explorer Cruise: Adults $34, children/teens (5-17) $22. San Francisco Sailing Company, Pier 39 Dock C (behind the Aquarium of the Bay), ☎ +1 415 378-4887, . Daily 9AM-9PM. Bay tours under the Golden Gate Bridge and private charters and parties with full catering. 90-minute tour, $40/person; private sailboat charters are more. Vallejo Baylink Ferry, Pier 41 (at Jefferson St and the Embarcadero), ☎ +1 877 643-3779, . Offering ferry service to Vallejo. Adults $13 one-way, seniors/children $6.50 one-way. Alcatraz Cruises, Pier 33, Alcatraz Landing, ☎ Box office: +1 415 981-7625 ([email protected], fax: +1 415 986-1721), . Cruises start at 9AM and continue throughout the day. Ten to 14 daily departures depending on the time of year. Evening tours offered Thursdays-Mondays. Information on the island can be found on the National Park Service's website . Adults from $28, Children from $17, Seniors from $26.25. Annual Tree Lighting Ceremony at Ghirardelli Square, Ghirardelli Square (at Beach and Larkin St), ☎ +1 415 775-5500 ([email protected]), . End of Nov: noon-5:30PM. Why not ring in the holiday season by attending the festivities at Ghirardelli Square. There's theater, live music, and then at the end they decorate the 45 foot Christmas tree with ornaments, lights, and chocolate bars... yum! Free. Crab Season. The festivities and excitement of Crab Season begin in November after a priest has officially blessed the fleet, sending eager crabbers out to land their catch. Local vendors fire up their blackened pots in preparation for the arrival of the delicious, and much sought-after Dungeness Crab. Approximately 1 million pounds of Dungeness are caught every year, ensuring that the feast lasts for several months. Fleet Week, ☎ +1 650 599-5057 ([email protected]), . Usually held in the first week of October, it's a tribute to the men and women in the armed forces. A flotilla of Navy ships dock on the Wharf in parade fashion, and there are many free deck tours available from crew members. There are also several air displays by the Navy's Blue Angels, Team Oracle, and the Air Force's F-16 Demonstration Team. Free, although you can pay up to $150 to watch the Air Show from premium select locations along the Marina Green and waterfront area. Fourth of July. 2PM-10PM, 9:30PM fireworks. San Francisco's main Independence Day celebrations take place on Fisherman's Wharf. There is lots of free entertainment during the day, particularly around Aquatic Park and all down Jefferson St. The festivities culminate with an impressive fireworks display from the foot of Municipal Pier, and at the other end of the Wharf from barges moored off the north of Pier 39. Free. Ghirardelli Square Chocolate Festival, Ghirardelli Square (at Beach and Larkin St), ☎ +1 415 775-5500 ([email protected].com), . First or second weekend in Sept: Sa-Su noon-5PM. Chocoholics — indulge your decadent side at this annual chocolate fest. Activities include chocolate tasting, chocolate sculpting, chocolate cooking demonstrations, and a chocolate eating competition. Free (chocolate tasting requires ticket purchase: $10-$20). Holiday Festival of Lights. Dec 14th 2008. The Holiday Festival of Lights is the official start of the holiday season in the city. Stores hang out decorations and lights and the piers are adorned with shimmering lights. Free. Opening Day on the Bay, Fisherman's Wharf Waterfront, ☎ +1 415 331-0702, . An annual boat parade, held on the last Sunday in April, that signals the start of the Northern Californian sailing season. Up to 200 vessels, decked out in full regalia, participate each year and sail from the Golden Gate Bridge to Pier 39. Impartial judges are on hand to award prizes in several esteemed categories. The event is organized by the Pacific Inter-Club Yacht Association. Free. The Anchorage Shopping Center, Anchorage Square (Leavenworth at Beach St), ☎ +1 415 775-6000, ext. 203, . Covering just one square block in Fisherman's Wharf, there are over 30 specialty shops and restaurants here. Northpoint Shopping Center, 900 North Point St (between Mason St and Powell St). Less touristy, and set back a few blocks from the actual Wharf, this shopping center contains 15 shops, including a Safeway supermarket, Walgreens drug store, GNC, and Radio Shack, as well as services such as ATMs and 24 Hour Fitness center. Chowder and Crab Sidewalk Stands, 200 Jefferson St (at Taylor St). 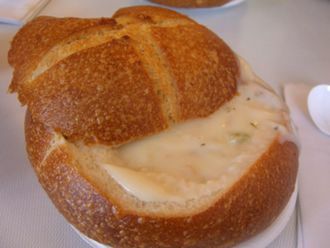 Get clam chowder in a bread bowl, Dungeness crab (in season November through June), fish and chips, shrimp cocktails, calamari salad, etc. from this busy outdoor marketplace. If you're getting a crab, ask for a fresh one and they'll cook it up for you on the spot. $4 and up. Chowders, Pier 39, Building A, Level 1 (at Beach St and The Embarcadero), ☎ +1 415 391-4737 ([email protected]), . Same hours as Pier 39. Serving fresh seafood cocktails, clam chowder in a bread bowl, fish and chips, sandwiches, and salads. They also have a small "Not so Fishy... " menu for those who don't like seafood. $5-$11. Darren's Cafe, 2731 Taylor St (between Beach St and Jefferson St), ☎ +1 415 673-3345. Mo-Su 8AM-4:30PM. Reasonably priced "mom and pop" Vietnamese/breakfast place on the Wharf. They serve Vietnamese dishes, soup, and sandwiches as well as more traditional breakfast options like country potatoes and omelettes. Small but friendly! $6-$9. In-N-Out Burger‎, 333 Jefferson St (near Jones St), ☎ +1 800 786-1000, . Su-Th 10:30AM-1AM, F-Sa 10:30AM-1:30AM. Standard In-N-Out Burger, but it has the distinction of being the only one in the city. They serve "fresh burgers" and fries cut straight from the potato in front of you... it's still fast food, but it's definitely better than the usual fare. This place gets seriously packed but the line does tend to move quickly. $5-$8. Beach Street Grill, 380 Beach Street (at Taylor St), ☎ +1 415-867-1711 ([email protected]), . Summer Hours (Jun-Nov)Open Monday thru Friday, 7 am- 2:30 pm, Saturday / Sunday, 7 am- 9 pm Winter Hours (Dec-May)Open Monday thru Friday, 7 am- 1:30 pm, Saturday / Sunday 7 am- 2pm. Organic and gluten free Fisherman's Wharf dining. $12-$30. Cafe Pescatore, 2455 Mason St (at North Point St), ☎ +1 415 561-1111 ([email protected], fax: +1 415 292-4549), . M-Th 7AM-10:30AM, 11:30AM-10PM, F-Su 7AM-10PM. A mid-range Italian trattoria that focuses on the staples of Italian food like pasta, pizza, and risottos. It being Fisherman's Wharf, they do have a particular focus on seafood however. $14-$25. Cioppino's on the Wharf, 400 Jefferson St (on the corner of Jefferson and Leavenworth Sts, across from the Cannery Building on the bayside of Fisherman’s Wharf), ☎ +1 415 775-9311 ([email protected], fax: +1 415 775-7044), . Open 365 days a year 11AM-10PM. Family dining with indoor and outdoor seating. Cioppino is a flavorful San Franciscan seafood soup. $14-$27. Eagle Cafe, Pier 39, Ste 201 (at Beach St and the Embarcadero), ☎ +1 415 433-3689 ([email protected]), . 7:30AM-9PM daily. One of the more reasonably priced places to eat on the Wharf. Traditional fare served. Pancakes are a favorite. $7-$30. McCormick and Kuleto's Seafood Restaurant, Ghirardelli Square, 900 North Point St (at Beach St and Larkin St), ☎ +1 415 929-1730 ([email protected], fax: +1 415 567-2919), . M-Th 11:30AM-10PM, F-Sa 11:30AM-11PM, Su 10:30AM-10PM. A good seafood restaurant that also serves other fare such as pastas and steaks. The restaurant is perched atop Ghirardelli Square and has magnificent views of the bay, as well as a spacious and airy feel inside. $11 and up. Pier Market, Pier 39 (at Beach St and The Embarcadero), ☎ +1 415 989-7437 ([email protected]), . Winter hours: M-Th 11AM-9PM, F 11AM-10PM, Sa-Su 10:30AM-9PM. Summer hours: M-Th 11AM-10PM, F 11AM-11PM, Sa 10:30AM-11PM, Su 10:30AM-10PM. Pier Market is a real market and restaurant at Pier 39. It's definitely one of the better seafood options on the Wharf; the fish always seems to be fresh, the service is fast and friendly, and the prices are pretty low given the quality. $10-$33. Rainforest Cafe, 145 Jefferson St, Suite 400 (between Mason St and Taylor St), ☎ +1 415 440-5610, . Su-Th 11AM-9PM, F 11AM-10PM, Sa 11AM-11PM. A jungle-themed restaurant with a wide variety of fare from chicken, seafood, pasta, pizza, and beef. Popular with young children. $5-$24. Sea Lion Cafe, Pier 39 (part of Neptune's Palace at the end of Pier 39), ☎ +1 415 434-2260 ([email protected], fax: +1 415 434-4208), . 11AM-8PM daily. Good restaurant if you're with kids; it serves fish & chips, fresh seafood entrées, cafe sandwiches, salads, and pasta dishes while watching the sea lions (but expect to pay a "San Francisco Minimum Wage Surcharge" with every meal). $9-$30. Alioto's, No. 8 Fisherman’s Wharf (Taylor St and Jefferson St), ☎ +1 415 673-0183, . 11AM-11PM daily. Established in 1925 by the Alioto family, it plates Sicilian recipes incorporating the local, fresh seafood. $22-$48. Castagnola's, 286 Jefferson St (across from Ripley's and the Wax Museum, and the nearby Ghirardelli Square), ☎ +1 415 776-5015 (fax: +1 415 776-0463), . 11AM-9PM daily. Voted San Francisco’s No. 1 Seafood and Family Restaurant of 1998 by The National Academy of Restaurant Evaluation and The Best of San Francisco Pocket Guide. They specialize in seafood and Italian cuisine, complimented by quality Californian wines. $20 and up. Crab House at Pier 39, Pier 39, Second Level, West Side (at Beach St and the Embarcadero), ☎ +1 415 434-2722 ([email protected], fax: +1 415 434-4038), . Su-Th 11:30AM-10PM, F-Sa 11:30AM-11PM. 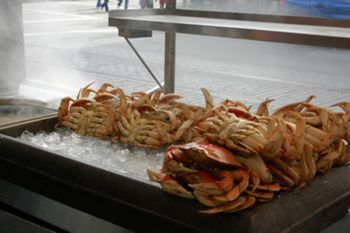 Voted "Best Crab in San Francisco" and famous for it's "Killer Crab" — 2 pounds of Dungeness Crab! Comes with great views of the Golden Gate Bridge. $18-$60. Forbes Island, Sea Lion Harbor — H Dock (between Pier 39 and Pier 41), ☎ +1 415 951-4900, . W-Su 5PM-10PM. Fancy a bit of an adventure for your next dining experience? Well, how about dining on a floating island? Forbes Island is a floating wooden island (100 foot by 50 foot) complete with a lighthouse, waterfall, and real palm trees. It was built in 1975 and was originally intended to be a floating home... the creator was inspired by the novel "Twenty Thousand Leagues Under the Sea." The dining room is partially under water and portholes give you a underwater view from your table. It's moored about 100 yards from the sea lions at Pier 39 and a pontoon ride will have to take you there and back... so don't drink too much! The cuisine is French. $30-$45. Nicks Lighthouse, 2815 Taylor St (at Jefferson St), ☎ +1 415 020-1300 (fax: +1 415 989-1544), . Su-Th 11AM-10:30PM, F-Sa 11AM-11PM. Warm and aromatic Italian restaurant serving popular family fare. $12-$37. No. 9 Fisherman's Grotto, No. 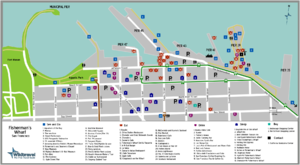 9 Fisherman's Wharf (Taylor St and Jefferson St), ☎ +1 415 673-7025 ([email protected]), . Su-F 10AM-10PM, Sa 10AM-11PM. On the side of the plaza, this restaurant is an old favorite. The small ground floor room has a warm Venetian inspired ambiance; the upstairs is larger and more modern. Its windows overlook the fishing boats. $14-$49. Sabella and LaTorre, 2809 Taylor St (Taylor St and Jefferson St), ☎ +1 415 673-2824 ([email protected], fax: +1 415 923-0585), . Restaurant: 10:45AM-10:45PM; Crab Stand: 7AM-10:45PM. A family owned restaurant that's been open since 1927 providing fresh seafood, family fare, and a full bar. They're known in particular for their "cracked crab". $11-$37.50. Scoma's Restaurant, Pier 47 on Al Scoma Way (where Jones and Jefferson Sts intersect), ☎ +1 415 771-4383 ([email protected], fax: +1 415 775-2601), . M-Th 11:30AM-10PM, F-Su 11:30AM-10:30PM, Closed Thanksgiving Day, Christmas Eve, and Christmas Day. The Bar is open daily 30 minutes prior to lunch service. Overlooking the bay and Alcatraz, and nestled amongst the fishing boats on Pier 47, this restaurant is popular among locals and tourists alike for its fresh seafood. $20 and up. Buena Vista Cafe, 2765 Hyde St (at Beach St), ☎ +1 415 474-5044 ([email protected], fax: +1 415 474-2207), . M-F 9AM-2AM, Sa-Su 8AM-2AM. 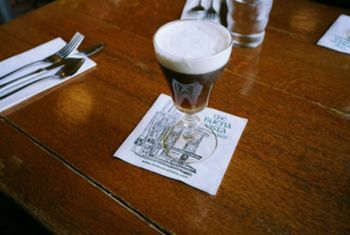 Famous for its Irish Coffee, supposedly the first to serve it in America, and great views over the bay. Entrees $9-$17. Forbes Island, Sea Lion Harbor — H Dock (between Pier 39 and Pier 41), ☎ +1 415 951-4900, . W-Su 5PM-10PM. $30-$45. Jacks Cannery Bar, 2801 Leavenworth St (at Beach St), ☎ +1 415 931-6400. 10AM-2AM daily. Opened in 1932. The bar has a 90 foot oak-paneled hall. 110 Beers on tap! Las Margaritas, Del Monte Square, 2nd Level, South Bldg (Jefferson St and Leavenworth St), ☎ +1 415 776-6996. 10AM-11:30PM daily. A Fruit Margarita in the Cannery anyone? Lou's Fish Shack (Lou's Pier 47 Restaurant and Blues Club), 300 Jefferson St (at Al Scoma Way), ☎ +1 415 771-LOUS (5687) ([email protected], fax: +1 415 771-7060), . Open at 11AM daily. Lou's has live Blues music 7 days a week. Cover Charge: M-Th: 4PM-8PM $3, 8PM-close $5, F: 4PM-8PM $3, 8PM-close $10, Sa: 4PM-8PM $5, 8PM-close $10, Su: 4PM-8PM $3, 8PM-close $5, Sa noon-3PM show is free. Red Jack Saloon, 131 Bay St (at Midway St), ☎ +1 415 989-0700. 11AM-2AM daily. Dive Bar, set back a few blocks from the Wharf, it's popular with Eastcoasters and Red Sox fans. Cheap drinks and a decent juke box. Ghirardelli Choclaterie and Cafe, Ghirardelli Square (at Beach St and Larkin St), ☎ +1 415 474-3938. M-Th 8:30AM-8PM, F 8:30AM-10PM, Sa 9AM-10PM, Su 9AM-8PM. Serving premium espresso drinks, pastries, and desserts. San Francisco Tea & Coffee Co., Pier 39 (at Beach St and The Embarcadero), ☎ +1 415 421-5119, . M-F 10AM-8PM, Sa-Su 10AM-10PM. Serving a broad range of organic teas, herbal teas, white teas, rooibos, and coffee. HI San Francisco Fisherman's Wharf Hostel (Hostelling International-Fisherman's Wharf), Fort Mason, Building 240 (Upper Fort Mason), ☎ +1 415 771-7277 ([email protected]), . checkin: 2:30PM; checkout: 11PM. Even if you're unsure about hostels, you should still consider this place; the location alone makes it worth your while, as it is in a park-like setting with great views of the Golden Gate Bridge and Alcatraz and is within easy walking distance of Fisherman's Wharf. It has a total of 150 Beds in dormitory style rooms. Quite clean and safe, with wi-fi, laundry facilities, lockers, and free breakfast. Dorms: $26-$30 Private family rooms: $65-$100. Travelodge by Fishermans Wharf, 1201 Columbus Ave (at Bay St), ☎ +1 415 776-7070, . checkin: 3PM; checkout: 11AM. $120-$190. Best Western Tuscan Inn Fisherman's Wharf, 425 North Point St, ☎ +1 415 561-1100 and +1 800 648-4626 (fax: +1 415 561-1199), . checkin: 3PM; checkout: noon. $180-$250. Courtyard-Fisherman's Wharf, 580 Beach St (between Mason St and Taylor St), ☎ +1 415 775-3800 (fax: +1 415 441-7307), . checkin: 3PM; checkout: noon. Part of the Marriott group, this non-smoking, four story hotel is just 2 blocks from Ghirardelli Square. $210-$290. Pier 2620 Hotel Fisherman's Wharf, 2620 Jones St (2 blocks southwest of Pier 39), ☎ +1 415 885-4700 (fax: +1 415 771-8945), . checkin: 3PM; checkout: noon. Formerly the Hilton Fisherman's Wharf. Non-smoking hotel. $240-$360. Holiday Inn Express San Francisco — Fisherman's Wharf, 550 North Point St (between Jones St and Taylor St), ☎ +1 415 409-4600 ([email protected], fax: +1 415 409-5111), . checkin: 3PM; checkout: noon. One of the better rated hotels on the Wharf. $200-$270. Holiday Inn — Fisherman's Wharf, 1300 Columbus Ave (between Jones St and Leavenworth St), ☎ +1 800 942-7348 (fax: +1 415 771-7006), . checkin: 3PM; checkout: noon. Among the bars, cafes, and the vast number of specialty shops in Fisherman's Wharf. $220-$270. Radisson Hotel Fisherman's Wharf, 250 Beach St (between Powell St and Mason St), ☎ +1 415 392-6700 ([email protected], fax: +1 415 986-7853), . checkin: 4PM; checkout: noon. Nice hotel, centrally located (only two blocks from Pier 39). Heated outdoor swimming pool. $190-$400. Suites at Fisherman's Wharf, 2655 Hyde St (between Bay St and North Point St), ☎ +1 415 771-0200 ([email protected]), . checkin: 4PM; checkout: 10AM. The Suites is a small (24 suites) but comfortable and modern hotel that offers one or two-bedroom floor plans with many amenities. $175-$250. Wharf Inn, 2601 Mason St (at Beach St), ☎ +1 415 673-7411 ([email protected], fax: +1 415 776-2181), . checkin: 3PM; checkout: 11AM. Small, friendly, and in the heart of Fisherman's Wharf. It has free parking. From $210. Argonaut Hotel, 495 Jefferson St (at the end of the Powell-Hyde cable car line and right across from the historical ships, with nautical exhibits next to the lobby), ☎ +1 415 563-0800 (fax: +1 415 563-2800), . checkin: 3PM; checkout: noon. A high-end luxury boutique hotel overlooking the bay and very centrally located on the Wharf. Ask for a room away from the front if you mind noise. It's a 100% smoke free environment. $250-$450. Hyatt-At Fisherman's Wharf, 555 North Point St (between Jones St and Taylor St), ☎ +1 415 563-1234 (fax: +1 415 486-4444), . checkin: 3PM; checkout: noon. Modern hotel with full-service and clean and comfortable rooms. $250-$350. Marriott Fisherman's Wharf, 1250 Columbus Ave (between Bay St and North Point St), ☎ +1 415 775-7555 and +1 800 551-6433 (fax: +1 415 474-2099), . checkin: 4PM; checkout: noon. 285 rooms and 11 suites. $200-$300. Sheraton-At Fisherman's Wharf, 2500 Mason St (at North Point St), ☎ +1 415 362-5500 ([email protected], fax: +1 415 956-5275), . checkin: 3PM; checkout: noon. This hotel is newly renovated and centrally located. $230-$290. California Welcome Center, Pier 39, P Building-2nd Level (on Pier 39, next to the Frequent Flyers), ☎ +1 415 981-1280 ([email protected]), . Winter hours: 10AM-5PM daily. Summer hours: 10AM-6PM daily. In addition to maps and info, the welcome center also offers a computer with internet access. $5 for 20 min.